The Giant Buddha of Leshan is carved on Lingyun Hill, east of Leshan City, Sichuan Province, at the confluence of three rivers, namely, Min River, Qingyi River, and Dadu River which is not far away from Mount Emei. The statue depicts a seated Maitreya Buddha with his hands resting on his knees. The statue makes itself the most renowned scenic spot in Leshan City. In December, 1996, the location of the Buddha was included by UNESCO on the list of the World Heritage sites. 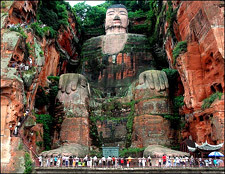 As the biggest carved stone Buddha in the world, Leshan Giant Buddha is featured in poetry, song and story. Construction began in 713 AD in the Tang Dynasty, led by a Chinese monk named Haitong. Completed in the year 803, the statue took people more than 90 years to carve. Concerned for the safety of the long-suffering people who earned their living around the confluence of the three rivers, Haitong hoped that the Buddha would calm the turbulent waters that plagued the shipping vessels travelling down the river. Tempestuous waters ensured that boat accidents were numerous and the simple people put the disaster down to the presence of a water spirit. When funding for the project was threatened, Haitong was said to have gouged out his own eyes to show his piety and sincerity. The project was half done when Hai Tong passed away, and two of his disciples continued the work. Construction was completed by his disciples ninety years later. The solemn Buddha is 71 meters high and its head itself is 14.7 meters high. Its ear is 6.2 meters long, eye 3.3 meters wide, and shoulder 34 meters wide. Its head is covered with 1,021 chignons. Its middle finger is 8.3 meters long, and each of the feet are 11 meters long and 8.5 meters wide, large enough to accommodate more than 100 people sitting on it. The huge figure sits with his hands resting on his knees, his head reaching the hilltop and his feet the river, occupying the entire hillside. Another architectural highlight is the drainage system. This system is made up of some hidden gutters and channels, scattered on the head and arms, behind the ears and in the clothes. This system, which helps displace rainwater and keep the inner part dry, plays an important part in the protection of the Buddha. The large pair of ears, each seven meters (about 23 feet) long, is made of wood and is decorated by mud on the surface. For craftsmen of thousands of years ago, it was not easy to fix these to the stone head. There is a local saying: "The mountain is a Buddha and the Buddha is a mountain". This is partially because the mountain range in which the Leshan Giant Buddha is located is thought to be shaped like a slumbering Buddha when seen from the river, with the Leshan Giant Buddha as its heart. To get to Leshan by train, get off at Emei station. This station is 10 kilometers (about six miles) away from the gate of Mt. Emei, and 31 kilometers (about 19 miles) away from Leshan City. It is 162 kilometers (about 100 miles) from Chengdu City to Leshan City if one travels by the expressway. Emei City and Leshan City, with a distance of 31kilometers (about 19 miles) are connected by a freeway, and there is a regular bus every ten minutes. Besides, there are buses to Chongqing City, Neijiang City, Zigong City, Yibin City and Ya'an City from Leshan City. Buses to nearby counties are also available. There are very many ferries to the site of Leshan Giant Buddha every day. Ferries to Yibin City, Luzhou City and Chongqing City are available at Leshan Port. Chengdu Shuangliu International Airport (CTU) is 150 kilometers (about 93 miles) away from Leshan City by freeway. Many train and air ticket offices are set up in the city. CNY 70 (Excluding CNY 50 for a boat trip).